We are taking a day of rest today, after all we are retired. I will take this opportunity to answer some of your questions on the RV lifestyle. How do you find driving a 40 ft RV? Actually, it is 39′ 10 inches. I do not find it as difficult as I thought. Remember, I have driven fire engines for 28 years. The thing to remember is that when I make turns, the 5th wheel will cut into the turn. To compensate for that, I make a wider turn than I would make with my car, sort of like the tractor trailers. Our main learning curve is backing up the Sphinx into a campsite. Although we are getting better, we have not got it down just yet. In one of your posts you indicated you had to be self sufficient. What does that entail, and how long can you do it? It means that we do not have to be hooked up to water, sewer, or electricity to maintain ourselves. For electricity, we have four 6 volt batteries. Supposedly that will provide our electricity for a week or so, not using the air conditioners. We have a 69 gallon fresh water tank, and three 40 gallon waste tanks, one for the toilet, one for the bathroom shower and sink, and the final one for the kitchen. We testing living without hookups for 3 days with no problem. At one campsite their water supply was contaminated and we used ours for 4 days with no problem. We did supplement that with bottled water. We also have a 5 KW generator to run the air conditioner and recharge our batteries. The generator runs off our propane tanks, which are two 30 pound tanks. When you are traveling down the road, how do you keep the food in your refrigerator cold? For the first few weeks of our adventure the weather was so cold we had no problem, so long as the doors remain closed. Unfortunately, we did not realize that the refrigerator was not level and the doors came open during transit. The lettuce rolled around the RV. After leveling it, we also had to put tension bars to prevent items from rolling around inside the fridge. Even leveled, we have to secure the doors to prevent opening while jostling The Sphinx down the road. Now that we are in the South, and the temperatures are in the 90’s, we have an inverter that converts our battery 12 volt DC power to AC 110 volt power. This is for the fridge only, and works great. 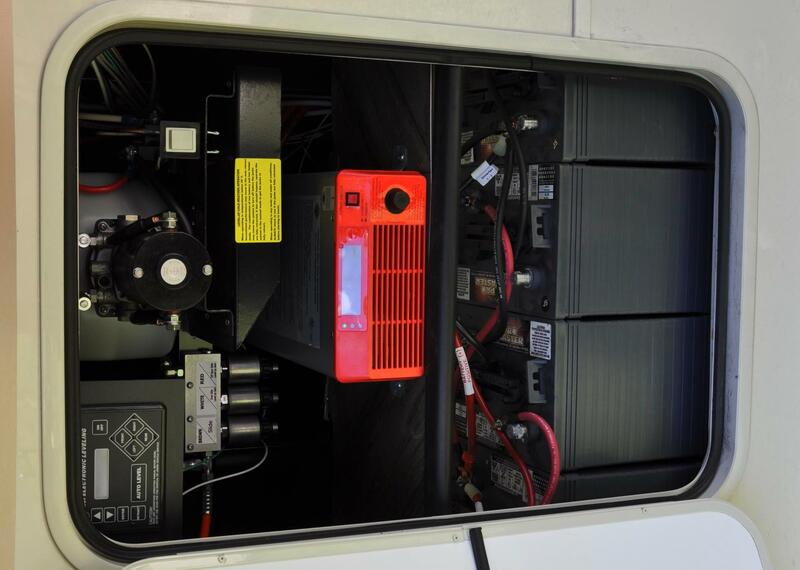 The red box is the inverter, below that you can see 3 of the 4 golf cart 6 volt batteries. How do you get your mail while traveling? We don’t. Prior to leaving I convert all bills and notices to electronic form. All my banking is electronic, and all my bills are paid through the bill pay of my bank. We even got our absentee ballots from Harford County electronically. We did have to mail the actual ballot in, but since they are in PDF format, I printed them out at the campsite office. All our taxes are done electronically, as well as keeping all my records. I have the laptop that I use to publish this blog, plus I have a scanner to convert all receipts that I get on the road. I then discard the paper receipts. With the exception of my credit card, all value cards, like food discount cards, have been converted on my I Phone to be electronic. The cashier can scan that electronic bar code as if I actually had the card. What do you miss most now that you are no longer living in your house? Nothing. We had to make adjustments in our lifestyle, but we anticipated that. We keep in touch with my father and other relatives by phone and messaging. We keep in touch with Chip and our granddaughters through face-time. Barbara wants to look at them on her tablet. Works great. My granddaughter just had her braces taken off, and Barbara can see her new smiling face. They also have an app on their smart phone that tells them exactly where we are. The purpose of this blog is to keep our friends and family informed of our whereabouts. We have adapted well to full time RVing. Oh! I see by the great electronic clock on the microwave, it is time for my nap. Feel free to send me any other questions, I will be happy to answer them. I enjoy reading about your RV adventures. Thanks for allowing others to tag along.